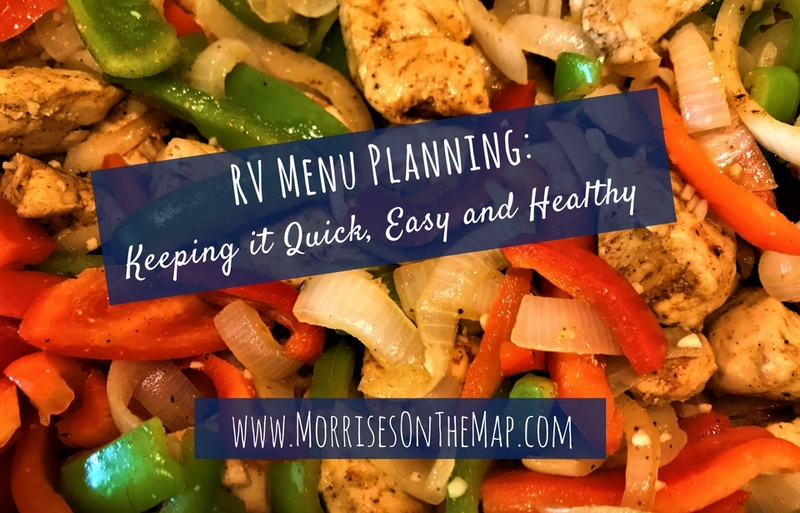 Quick, easy and healthy meal planning for your next RV road trip just got easier. Last summer, we went on a 6 week road trip. We knew we would have long travel days and even longer touring days. I set out to find a way to keep our meals quick, easy and healthy. My plan required a lot of planning and meal prep in advance, but we were pleased with the outcome. Less time cooking gave us more time for enjoying the places we visited, and we were still eating healthy meals. Planning is essential to making this menu work. I sat down over a month before our road trip with a calendar and made our menu. On the menu were meals such as taco soup, drunken chicken, taco salad, pork chops and baked chicken. Now you may be thinking, “Those don’t sound quick to me.” But I assure you, with our plan, it was really simple. When I was making my trip menu, I also made my menu for the month before the trip. I kept the menus very similar and this allowed us to double our recipes the month before our trip. Here is where I get to tell you about my favorite part of this plan…freezing meals. I know, I know. 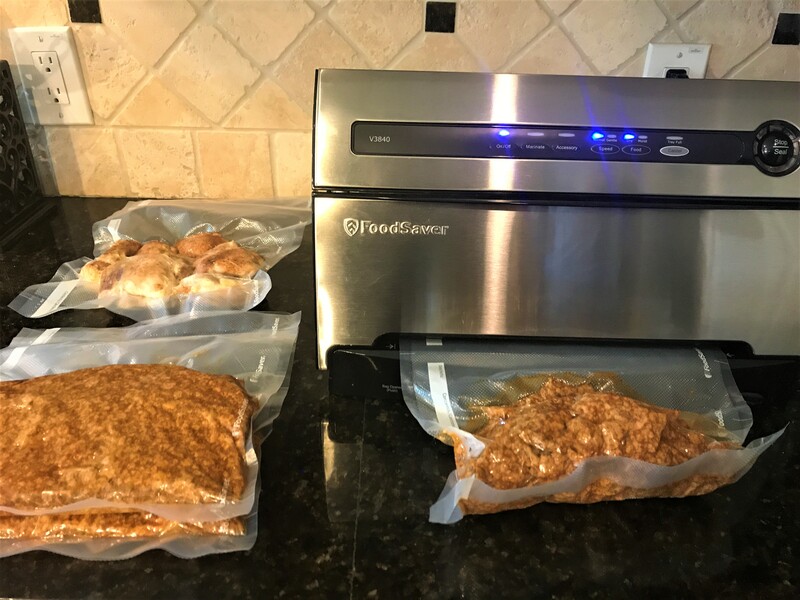 You are probably thinking,”How on earth did they get 6 weeks worth of frozen meals in their RV freezer?” Full disclosure, we do have a residential refrigerator in our fifth wheel, but with my favorite RV meal prep gadget you could probably fit a couple of weeks worth of meals in a regular RV freezer. I would not have been able to make this plan work without our FoodSaver. This awesome gadget allows you to vacuum seal your food after cooking it. The thing I love about using it for RV meal prep is it pulls all of the air out of the bag and you are able to press the bag flat. This allows for easy stacking and more space in your freezer. It is amazing how flat 2lbs of taco meat can be when using the FoodSaver. If you do not have a lot of freezer space, another way we prepared meals in advance is to can them. I had never canned prior to meal prepping for our 6 weeks trip, but after talking with some friends about their trip preparations, we decided to give it a try. 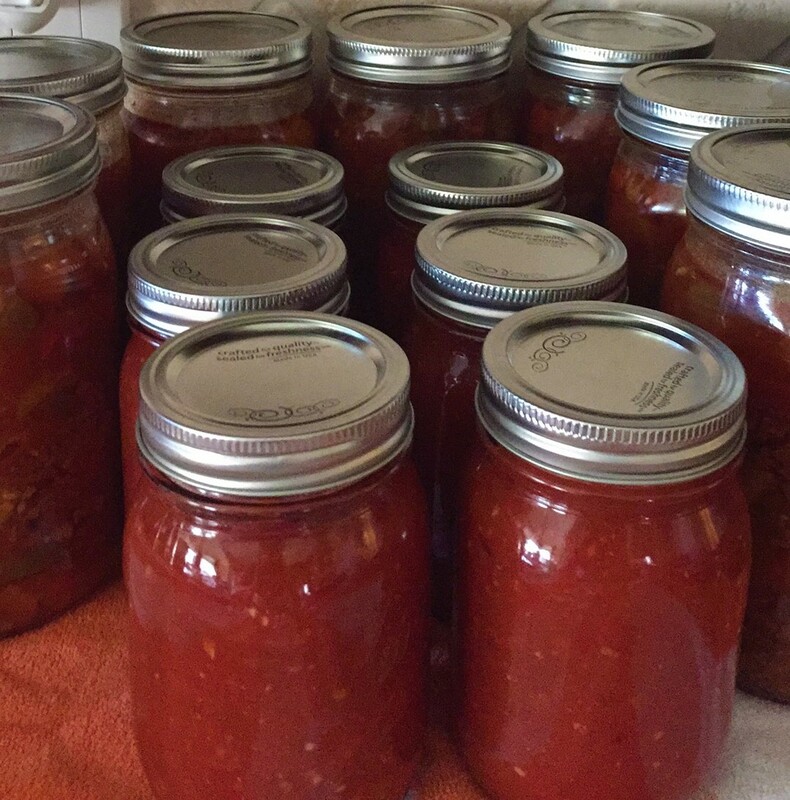 We started out small and just canned hamburger soup and homemade salsa, but this allowed us to save freezer space as well as time. We stored the jars in a box under our bed to also save pantry space. 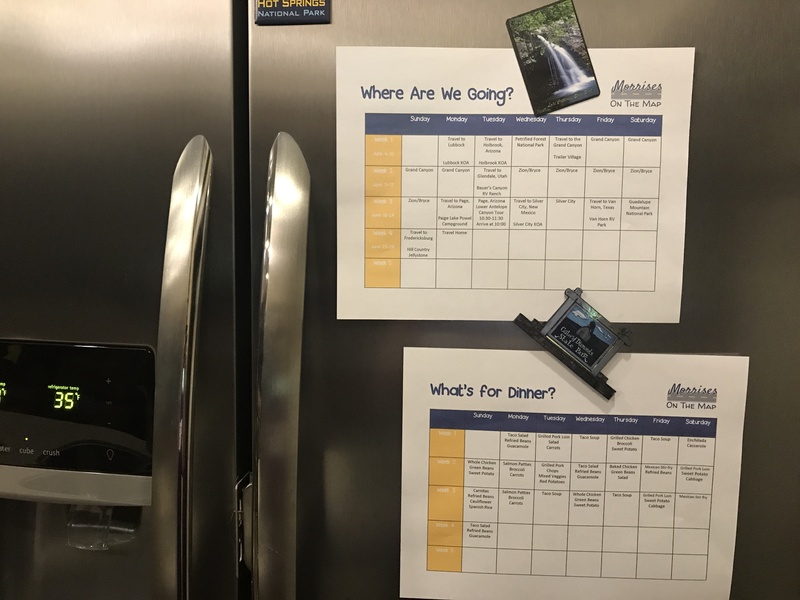 When we are on our trip, I keep a menu hanging on the refrigerator. Each morning, I check the meal plan and pull out that evening’s main course and place it in the refrigerator. That evening, I just have to heat up the main course and cook the sides. For side items, we try to keep it simple and healthy. Baked sweet potatoes, salad, green beans, steamed broccoli and carrots are some of our go to’s. Some meals, like Taco Soup, I have cooked the meat, but just need to open up cans, mix together and cook for a short time to complete the meal. All of this makes for quick and easy meal prep in the RV. All I have talked about so far is dinner, but what about breakfast and lunch? I usually do not plan these meals in advance, because they stay very similar each day. For breakfast, we like to eat bacon, turkey sausage or apple chicken sausage with either fried or scrambled eggs. Depending on leftovers, we may make omelets. The kids like to eat cereal, and we may even splurge occasionally and make pancakes. When on the road, we always stop at roadside parks and have picnics, and when we tour, we usually have picnics, so sandwiches and wraps are convenient. If we are having a rest day and staying at the RV, we can eat any leftovers we have. With this plan, we don’t usually have too many leftovers because I freeze the meals in the portion sizes I think my family will eat in one meal. There are so many benefits to meal planning and freezing ahead. The most obvious is saving time! Who really wants to be in the RV cooking, while everyone else it outside enjoying the great outdoors. Traveling can get expensive, but, with this plan, we save so much money by not eating out and not wasting food. I am not saying we never eat out, because we do. But with this plan, we ate out much less and saved our eating out for unique restaurants we really wanted to try. We never stopped at a restaurant, just because we did not want to cook that night. Also, we did not waste any food. On previous trips, I would often waste food, because we were so busy and at the end of a long day, we would just eat something quick or eat out, instead of cooking. So meat and veggies would sit in the fridge and go bad. With this plan, the meals were in the freezer, so I did not have to worry about them going bad. I have something planned for each night, but if we do decide to eat out, I just prepare what I took out of the freezer the next night. At the end of the trip, we had very few meals left, but the beauty is we just ate them at home. We were able to focus on unpacking and resting instead of cooking. Also, in the past, we reverted to eating things like hotdogs and spaghetti because they were quick and easy meals. We found all of those meals that are quick and easy fixes to usually be high in carbs. Since, we try to limit our carb intake having these meals already prepared made eating healthy quick and easy, too. We use this plan when we are going on multi week trips where we know we will not be spending a lot of time at the RV. When we are going to one place and will be spending a lot of time at the campground, we do a lot of cooking on our outdoor kitchen and on the fire. I will take a few frozen meals, just for those occasions when I would rather relax than spend a lot of time cooking, but for the most part we cook each night. I reserve this plan for those trips where I would rather spend time enjoying the amazing sights we are seeing instead of spending a lot of time cooking. 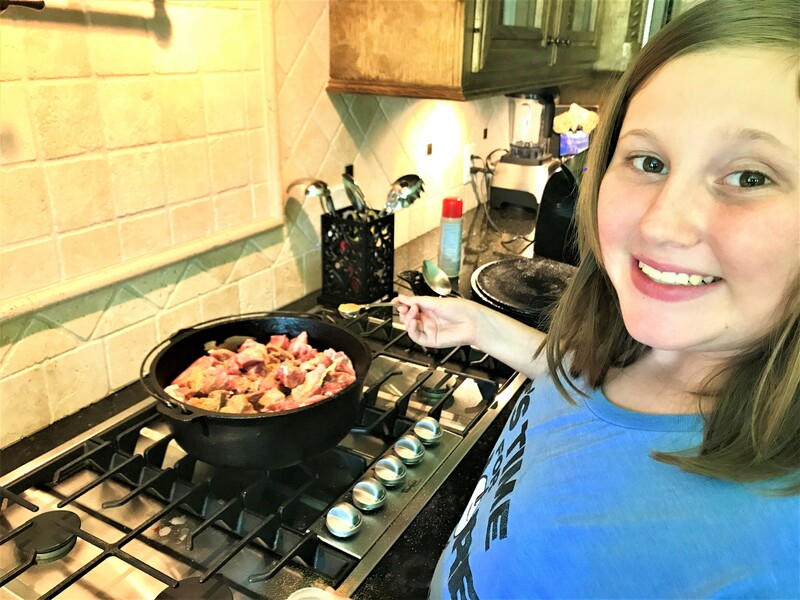 I hope by sharing how we plan quick, easy and healthy meals on our extended RV road trips, we can help your family do the same! If you have quick and easy meal planning tips, we would love to hear them! Just leave us a comment! Don’t forget to signup for our newsletter.  If you liked this post, you may like our tips in our post about saving money for RV travel!